A lady goes into a pet store to buy a songbird. While she’s walking around she hears a bird singing beautifully, and in a trance, she follows the sound to the back of the store. There in a cage is a cheerful little canary just singing her heart out. A sign on the cage reads, “$1,000 for the pair.” She looks deeper into the cage and in the back she sees a poor haggard little bird with its head down, shaking it from left to right. I went out for a short paddle to test out my new kayak seat (Thanks M&D!). Launched in the Indian River off the causeway near Cocoa where I found a little cove area sheltered from the north wind. Right away I had some action, and I caught little dink trout on the first two casts! A little later while paddling and trolling a plastic gulp minnow behind me, I had a big strike that peeled off a bunch of line. 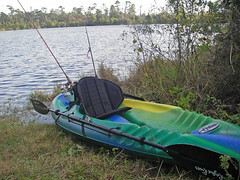 I tightened the drag and the fish started pulling me around, and out into windy water. I figured it was a sailcat, and was mentally preparing to cut him loose and keep the slime off the boat. To my surprise it was a nice redfish! 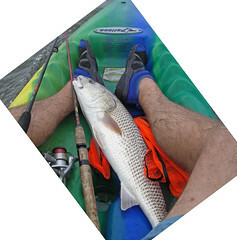 First big fish in the ‘yak – I managed to pull him into the plastic boat and get the jig out of his mouth. I was not prepared for a nice fish like this. I didn’t even have a cooler in the car, so I revived and released him. Then headed for home. I was only out on the water for about an hour. Its a terrific birthday so far. Last night had a wonderful dinner at Bergamo‘s singing restaurant with the P’s. Our server was a lovely young woman who I’ve caroled with a couple of times this season. And then this trophy fish this morning. Later tonight, I have two caroling gigs at private houseparties, and a featured part in the 11pm Christmas eve music service at church. 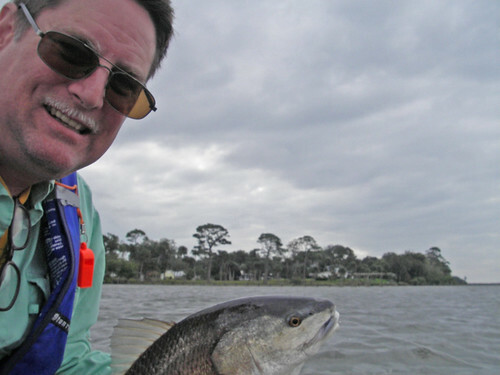 Fishing and singing – who could ask for more? Short video from nephew Austen of their family tree trimming. Great music choice, very very cool. Nicely done Austen – Merry Christmas! One of the quartets I’ve sung with this season…includes Seth and Susan R.
Linda and I were listening to the radio the other day and that old chestnut “Baby, its cold outside” came on. Only there was something oddly familiar about the singers. Could it be? Two of the most distinctive vocalists of our generation. It sounded like the high country warble of Dolly Parton and the hoarse breathy tenor of Rod Stewart! I tracked it down. Its a track on Stewarts 2006 release Stardust… The Great American Songbook, Vol. III. And he does indeed duet with Dolly Parton. It isn’t too bad, but the baggage each singer brings to the performance gets in the way for me. You can hear a brief audio clip on this amazon.com page for the album. Scroll down a couple of screens. Look at some of the other artists who have covered this song: Leon Redbone, LeeAnn Womack (I’ve got that version), Bette Midler, more. Seasonal a cappella singer with The Caroling Company, holiday season 2007, 2006, 2005. A fellow caroler sent me this link of Indiana University’s a cappella group singing an awesome Christmas arrangement. Its a little long, but full of surprises! It was recorded back in 1998.
Who knew? Who knew that a bunch of guys standing around a stage, in ties and tails, nine years ago, would be so popular? Who knew that a short clip on YouTube would be viewed over three million times? That’s right, I said million! And who knew that A-Cappella.com would itself sell over 1200 of these DVDs in a little over a week? I bet those Straight No Chaser guys didn’t. And we certainly didn’t. But apparently, those of you in the know did, because you’ve already ordered your copy of Live at the Musical Arts Center, the DVD that features Indiana Straight No Chaser singing “that Twelve Days of Christmas” song, as it’s come to be known online.